Following unanimous House passage of Rep. Rob Kauffman’s legislation to designate Nov. 21 as Children’s Grief Awareness Day, Kauffman was joined in the House chamber by members of the Drew Michael Taylor Foundation. Pictured, from left, are Marcy Douglass, Randy Taylor, Kauffman, Marcie Taylor, Cathy Campbell and Kurt Dunkel. HARRISBURG – On Monday, Rep. 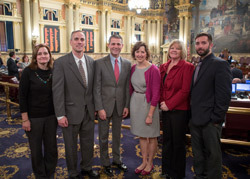 Rob Kauffman (R-Cumberland/Franklin) had the honor of hosting the founders of the Drew Michael Taylor Foundation, based in Shippensburg, to the state Capitol for the passage of his House resolution designating Nov. 21 as Children’s Grief Awareness Day in Pennsylvania. Millions of children across the state and nation are dealing with the loss of a loved one. Statistics report that before they graduate high school, one out of 20 children will experience the loss of a parent. Many more will deal with the loss of an aunt, uncle, grandparent or other close family member or friend. “Going through the grieving process is difficult enough for an adult, but children can often have a much harder time processing what has happened. They may have trouble adequately expressing their emotions or knowing how to deal with grief in healthy, constructive ways,” said Kauffman. Children’s Grief Awareness Day, which was created by the Pennsylvania-based Highmark Caring Place in 2008, aims at driving support to children and their families throughout the grieving process. It is through the Highmark Caring Place that the Drew Michael Taylor Foundation first learned of Children’s Grief Awareness Day. Programs, like those offered through and supported by the Highmark Caring Place, the Drew Michael Taylor Foundation and many others, give children and their families the tools to better cope with their loss. “To show support for Children’s Grief Awareness Day, I encourage individuals to wear blue on Thursday – the color the movement has adopted for its cause,” said Kauffman. House Resolution 542 passed the House unanimously.